The name of the book is Wait Til Next Year: A Baseball Memoir and the author is Doris Kearns Goodwin. Doris won the Pulitzer Prize in history for No Ordinary Time and has authored a number of historical books such as The Fizgeralds and the Kennedys and Lyndon Johnson and the American Dream. Doris is a baseball historian and you may have seen her in Ken Burns’ Baseball documentary. The book is set in New York in the 1950’s and describes Doris’ early life. The reader meets her mother and father as well as neighbors and friends. Her mother is suffering from a debilitating illness and her father happens to be a huge Brooklyn Dodgers fan. Doris grows up in the shadows of her mother’s illness but manages to find joy in discussing baseball with her father, listening to games together, and reading newspaper articles about the team. He gives her a score card at the age of six, and she uses it to record games and then recap to her father when he misses games due to being at work. I thought this was a well-paced book. I really admire the way it weaves through not just baseball, but through personal family matters and the events of the day, such as the Cold War. Although I have often seen baseball documentaries covering the golden age of baseball in New York, it is nice to get a different perspective, through the eyes of a child growing up through the era. After the first couple chapters I easily visualized the neighborhood and the people due to the rich imagery and language used throughout. As baseball fans know, not everything remained the same and readers should be able to feel the pain as Doris takes us through the Dodgers moving to Los Angeles. You can feel innocence being ripped away when this happens in the book. 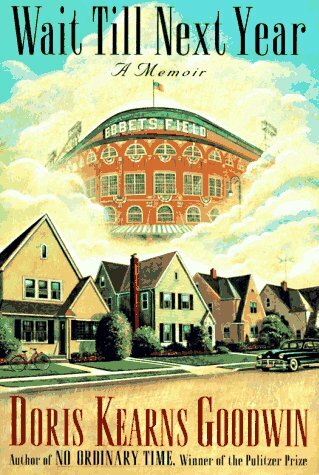 I should mention that while baseball is at the core of the book, being a baseball fan or having familiarity with New York in the 50’s is probably not necessary to derive enjoyment from reading the book. There are plenty of places where baseball falls into the background and other events take the forefront of the story. Kirkus reviews gave a bit of a mixed review, saying “Except for the final chapter about her mother’s death and her father’s subsequent depression and drinking problems, the book falls far short of her compelling historical narratives.” I haven’t read any of Doris’ other books so I can’t say if I agree with this assessment, but I think this memoir stands well on its own. It was a book I could easily put down and return to a week later – I believe because it just felt comfortable like an old friendship. Two thumbs up in my opinion! I’ll be interested to see if Doris Kearns Goodwin is still working with Bud Selig on his memoir as I haven’t heard anything lately. ← This Day in Milwaukee Brewers History – .500 Again!